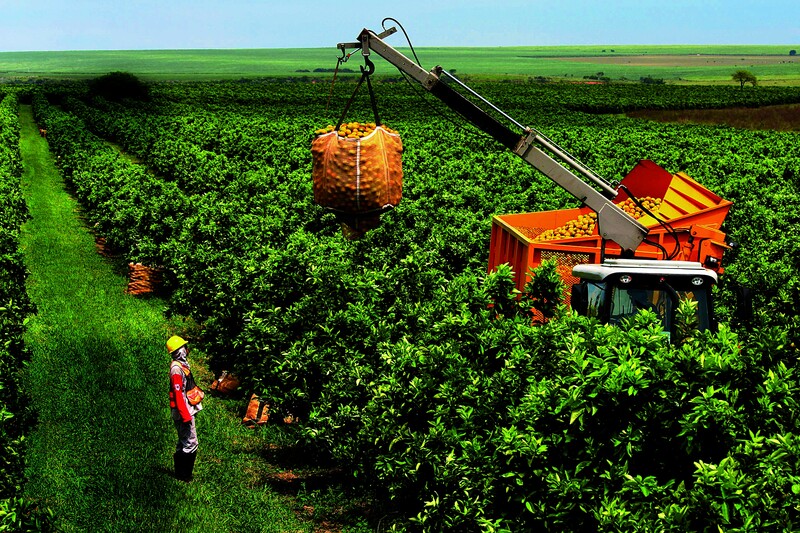 Where does Brazil’s orange juice industry source its oranges? What are the estimated percentages of oranges from each of these categories? There are no official figures showing what proportion of the oranges comes from the industry’s own orchards, or from independent growers selling on the spot market or through contracts. However, we do know that the spot market accounts for only a small amount of the fruit, while most oranges are sourced from the industry’s own orchards or from hired growers. Is it possible to sketch a profile of the orange growers as to the size of their farms, their yield, and the amount of oranges they sell? 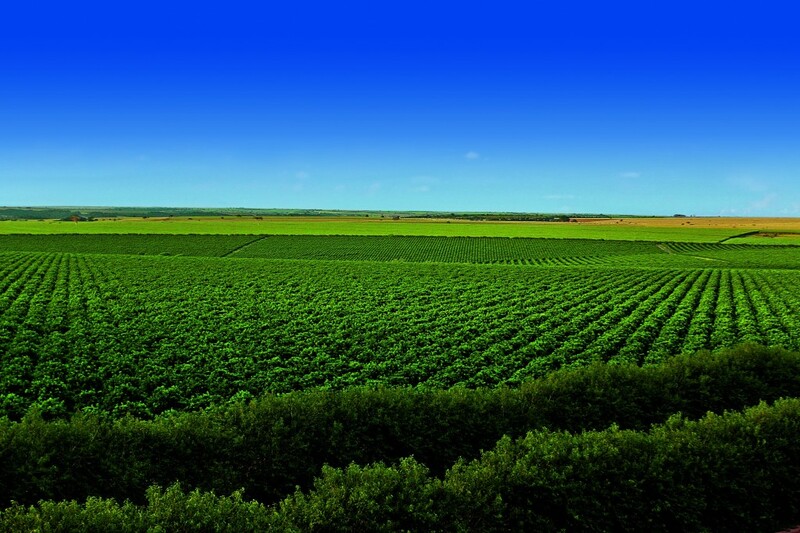 Fundecitrus—the Fund for the Promotion of Citrus Growing, headquartered in Araraquara—published a comprehensive diagnosis of Brazil’s citrus growing belt in May 2015. Its project—named PES for Projeto de Estimativa de Safra, Crop Estimate Project—showed that the vast majority of farms, in absolute terms, belong to small farmers. 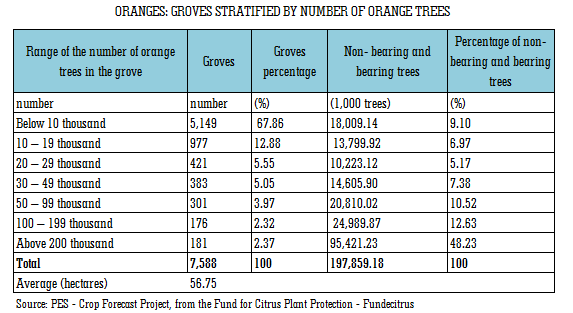 Farms with fewer than 100,000 trees make up 95% of the total number of citrus farms. 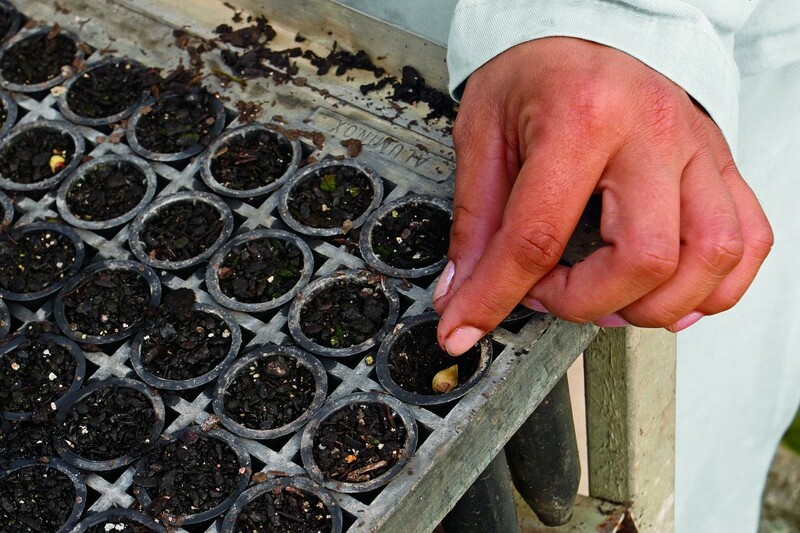 How does the orange-growing industry address sustainability and social issues? Does it follow a code of conduct? Brazil’s orange and orange-juice sector is a benchmark for professionalism, technological development and best practices. CitrusBR, representing the major Brazilian orange juice producers and exporters (Cutrale, Citrosuco and Louis Dreyfus) is a founder member of the European Corporate Social Responsibility Platform and a member of AIJN (the European Association of Fruit Juices)’s Corporate Social Responsibility Expert Group. The AIJN CSR Group has developed a code of conduct for the industry, based on the former SGF code of conduct and on the six principles of the CSR Platform Roadmap (in turn, based upon the United Nations Global Compact Food and Agriculture Business Principles). The code of conduct is based on the International Charter for Human Rights, and on ILO Conventions, UN Conventions and guidelines, SAI Sustainability Assessment and other internationally recognized standards. Its goal is that every player in the fruit juice value chain should work in compliance with minimal internationally recognized standards in the fields of human rights, labor legislation and environmental laws. The code of conduct lays down general aspects to be observed, but Brazilian labour and environmental legislation includes additional, more specific obligations that orange growers and orange juice companies must follow, along with other players in the value chain. Brazil’s labour legislation is internationally acknowledged to be one of the strictest, offering workers a high degree of protection, just as Brazilian environmental legislation is also recognized as one of the world’s most comprehensive. How are these standards enforced? Are there certificates or verification systems? Brazil exports approximately 65% of its output to the European continent. The European juice industry has, for more than 25 years, possessed an independent quality control system that certifies juice processors and raw materials suppliers from the whole world. SGF, a certifying entity based in Germany, carries out frequent inspections in over 60 countries including Brazil, visiting more than 400 suppliers. In regard to the enforcement of Brazilian legislation, the Ministry of Labour and Employment is solely responsible for carrying out inspection of working conditions and for applying fines and other warnings and penalties. 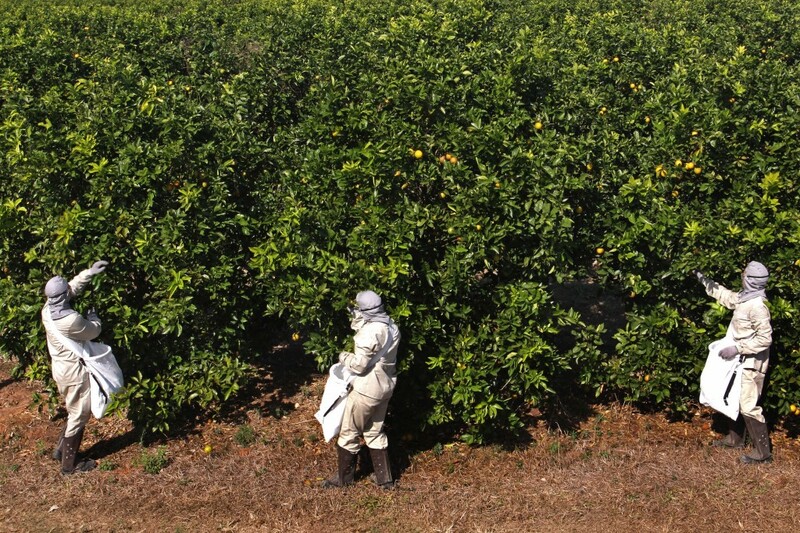 The Ministry has often turned its attention to the orange juice industry, inspecting farms and taking measures when necessary, and this has been published in the Brazilian press. The Brazilian government is also responsible for enforcing the environmental legislation. What type of certification do Brazilian producers possess? Do they comply with any standards for social and environmental aspects? Are they applied to all levels of production, including farms? What percentage of production is covered by these standards? 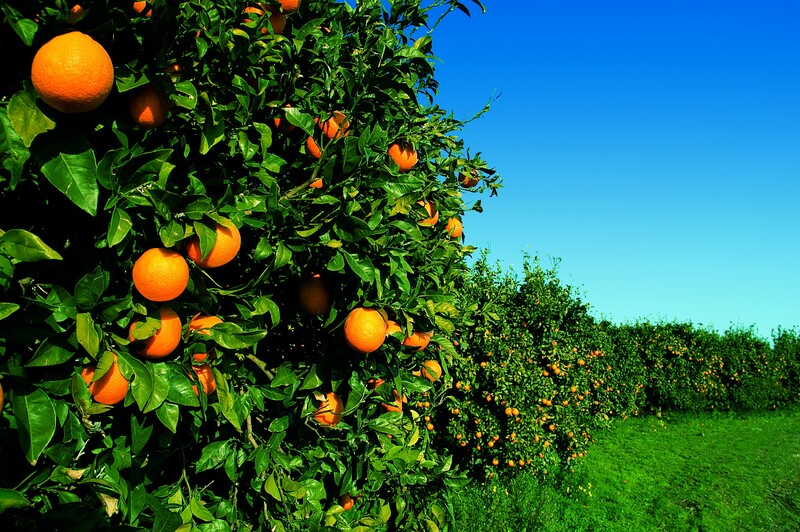 Some growers or companies have a range of different types of certificates, but these are not necessarily demanded of orange growers that supply the industry. In general, purchase and sale contracts for raw material stipulate the need to follow and comply with Brazilian legislation, which is in any case very thorough and strict insofar as labour, social and environmental issues are concerned.